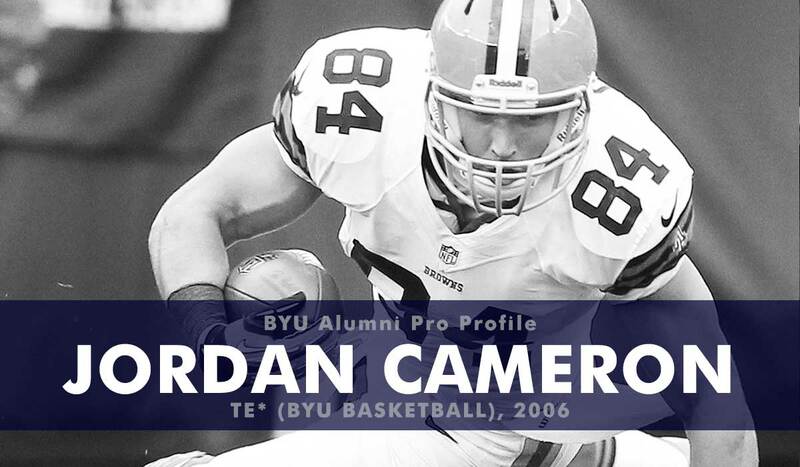 Jordan Cameron was never a part of the BYU football team… he was, however, a student at BYU prior to his football career at USC and in the NFL. Cameron came to BYU in 2006 on a basketball scholarship and spent a year as a student as he redshirted the 2006-07 basketball season. He then transferred to USC to play football (and support his sister Brynn), so he never actually competed as an athlete for BYU. Before playing at USC, however, Cameron enrolled at Ventura College because most of his BYU grades didn’t transfer. He enrolled at USC in 2008 and played two years at receiver before moving over to tight end as a senior. In his final season he caught 16 passes for 126 yards and a touchdown. Despite a lackluster collegiate career, Cameron received an invite to the East-West shrine game and to the NFL combine where he wowed the scouts in the drills. Consequently he climbed the draft boards and was drafted to the Cleveland Browns in the fourth round of the 2011 NFL draft with the 102nd overall pick. Cameron played in eight games as a rookie and had six receptions for 33 yards. In his sophomore season he saw more playing time, but it was his third season where he really broke out. In 2013 Cameron had 80 receptions for 917 yards and seven touchdowns and played in the Pro-Bowl. Unfortunately, the following season was less productive and he waived, but then signed by the Dolphins as a free agent. In his second season with Miami Cameron played in all 16 games and caught 35 passes for 386 yards and three touchdowns. Concussions forced Cameron into an early retirement from the NFL in 2017.